Aside from the fact that i used to love experimenting with my hair color and even ended up being super blonde i decided to go back to my natural hair color about 5 years ago. It was probably one of the best decision to fully embrace my natural curls. Ever since then i'm dying my hair with Wella Illumina Color (never change a winning team) at home every other month in order to keep my hair look fresh and vibrant. Of course, it often takes a few hours to get professional results but over the last few weeks my schedule has been so packed that quite frankly i have not been able to make the time. So after postponing my hair color treatments for weeks i luckily got my hands on the new Wella Invigo Series ‚Color Brilliance’. Especially this composition is a highly effective combination of copper-binding molecules, Vitamin E and lime caviar that protects colored hair and preserves ist luminosity. I have to say that over the years i have tried out various products to ensure fast and effective care for my hair that also gives immediate color shine and color protection at the same time but i’ve never experienced such a long period without coloring my hair. 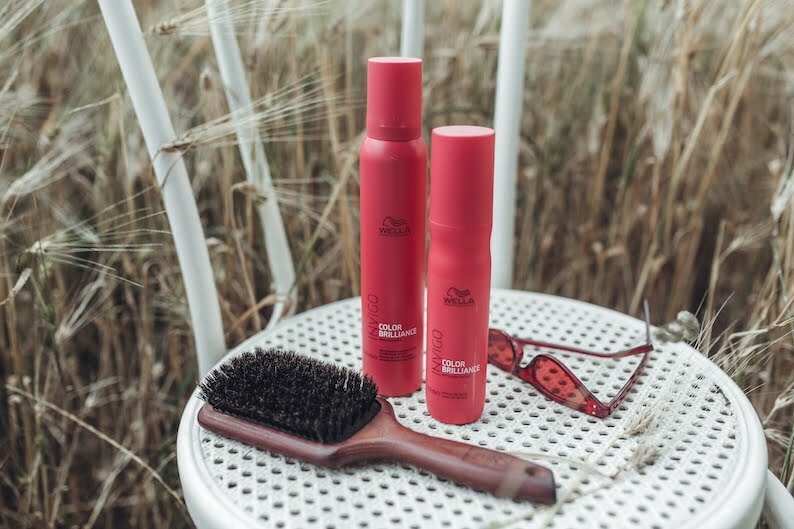 The whole series includes five premium products, most notably the Color Protection Shampoo which gives even fine hair brilliant shine. IN stands for advanced ingredientes, VI for invigorating and GO for fast time off (on the go). Since we all have different hair types and needs women can choose from six specialzed care lines, each containing mor than 76 percent natural or naturally derived ingriedients such as lime caviar, goji berries, cotton or lotus extract. The best part is yet to come! Wella is kindly giving some of my lovely readers the opportunity to experience their magic with a wonderful giveaway. 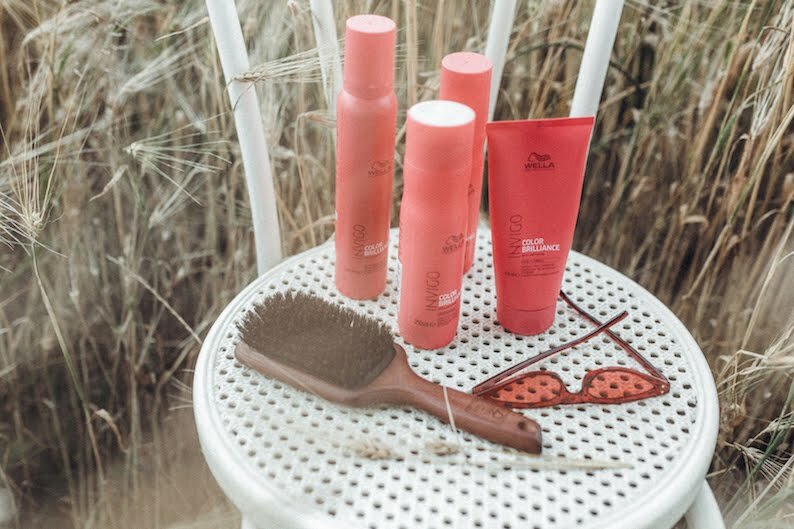 3 of you get the chance to win a Wella Invigo package that includes 3 products of the Color Brilliance series (Shampoo, Conditioner & Miracle BB Spray). All you have to do is pretty easy. Leave a comment below or send me a dm. The winners will be chosen randomly next week on the 4th of July. Good Luck! Back in the day when i was not even living in Vienna i’ve delveloped a major love affair with vintage pieces. Unfortunately i rarley go to visit fleamarkets or vintage shops but i am definitely planning on changing this fact in the upcoming months. Adding a piece with an unknow history to my closet is still one of my favorite things to do. That’s why i’m pretty happy that my boyfriend shares the same passion cause when i stumbeld across this amazing blue shirt at his wardrobe i couldn’t resist wearing it right away followed by compliments i received while showing up at the Austrian Press 2 weeks ago. Over 3 months ago i’ve been to Verona for the second time in my life! I have to say that whenever i’m in Italy it always feels like home. Besides my love for the architecture, the language, and the food i am truly a fan of the italian way of life. It’s about taking time for the beautiful things in life. That’s why i decided to take a break from the big city life and come to Salzburg for a couple of days in order toi enjoy the beautiful countryside where i grew up and spend some time with my family! I don’t often get the chance to be super spontanous and visit my hometown on a regular basis but since i realized that a had a little gap til the next job in Vienna i thought – why not. So here i am back where i started my blog more than 8 years ago and taking a little break from my everday life. I am more than happy that i finally found the time ro recharge my batteries and enjoy life without those hectic moments.